Click on titles for detailed information; Click on scores to view. Apsis for Duo Gelland, violin duo, 2016. (11 minutes). Nutation, flute/clarinet duo, 2015. (6 minutes). La Disparition, paetzold subgreatbass recorder in C, 2015. (9 minutes). Lloyd Ultan Recital Hall, University of Minnesota, 7 October 2013. School of Music, University of Minnesota, 9 April 2013. Jeffery Kyle Hutchins & Alex Richards, baritone saxophones. Recital Hall, University of Illinois, Champaign, IL, 23 March 2014. Recital Hall, University of North Texas, Denton, TX, 10 February 2014. Pléonasme, string quartet, 2012. (9 minutes). • Acanthes Festival, IRCAM, Espace de Projection, Paris, France, 30 June 2012. 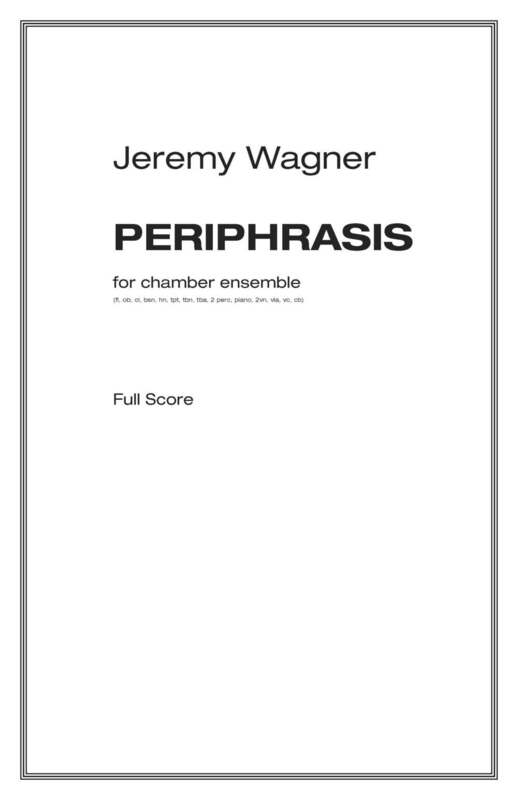 Periphrasis, chamber sinfonia (1, 1, 1, 1 - 1, 1, 1, 1 - 2 perc, pno - 1, 1, 1, 1, 1), 2012. (13 minutes). • School of Music, University of Minnesota, 1 May 2012. CMW Ensemble, Erik Rohde, conductor. Hisham Bizri’s Sirrocco (Shluq), adaptation film score/sound design, 2011. (15 minutes). • Ted Mann Concert Hall, University of Minnesota, 9 December 2010. • Deptford Town Hall, Goldsmiths College, London, UK, 20 June 2011. • School of Music, University of Minnesota, 30 April 2010. CMW Ensemble, Shanti Nolan, conductor. • School of Music, University of Minnesota, 9 December 2009. A Transmer Criptica, chamber ensemble (fl, ob, cl, cl, sx, bsn, hn, tpt, tbn, perc, gt, vc, cb), 2009 (11 minutes). • School of Music, University of Minnesota, 12 May 2009. CMW Ensemble, Robert Whalen, conductor. Jeph d’ba d’baef d’ba, string quartet, 2008. (11 minutes). • Nina Bliese Gallery, Minneapolis, MN, September 1 - 30, 2007. Flowers of Learning: Sonic Structures on the Works of Roman Verostko, artist collaboration / gallery installation, 2007. (65 minutes). • Nina Bliese Gallery, Minneapolis, MN, April 13 - May 25, 2007. Evaporations, for orchestra, 2006. (7 minutes). • School of Music, University of Minnesota, 14 April 2006. University of Minnesota Orchestra, Robbert Debbaut, conductor. Twittering Machine, saxophone quartet, 2004. (5 minutes). • 2004 Kansas Music Educators Association Conference, 1 October, 2004. The Passing of the Year, mezzo-soprano, piano, 2003. (6 minutes). • Wiedemann Concert Hall, Wichita State University, 25 November, 2003. 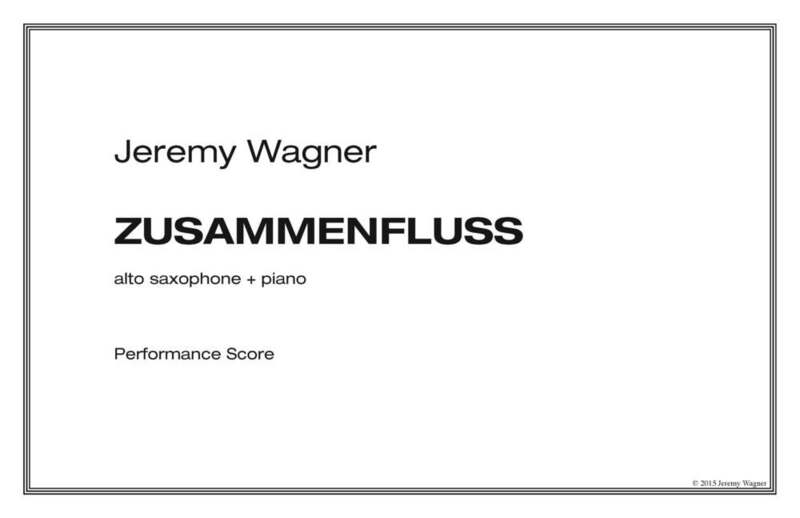 Three Conversations for Two Clarinets, clarinet duo, 2003. (10 minutes). Road Rage, string quartet, 2002. (12 minutes).